Let’s hope it’s easier to use than the first one, though. Bitdefender’s first-generation Box had an interesting premise: defend your home’s collection of webcams and other connected devices from attackers. But it was unnecessarily complex. Now the company’s returned with an upgraded device that applies more sophisticated protections, its executives say. The Box V2 will probably be sold for $199 plus a $99 yearly subscription, according to a spokesman for the company. That’s the same as the first-generation Bitdefender Box, which debuted in April 2015. Now, Bitdefender has revamped the exterior of the device, giving it the hip cylindrical shape of Google’s own OnHub router or the Apple Mac Pro. A small LED turns red or blue to reflect the status of the device. The internals have also been upgraded, with a dual-core ARM Cortex A9 processor and 1GB of RAM for improved performance. The idea behind Bitdefender’s first products was that it was smart enough to protect routers, webcams, connected refrigerators, you name it—essentially providing antimalware solutions across your entire network. With the updated Box, the device applies machine learning and sniffs your traffic as data flows in and out of your network. There’s two things going on here. 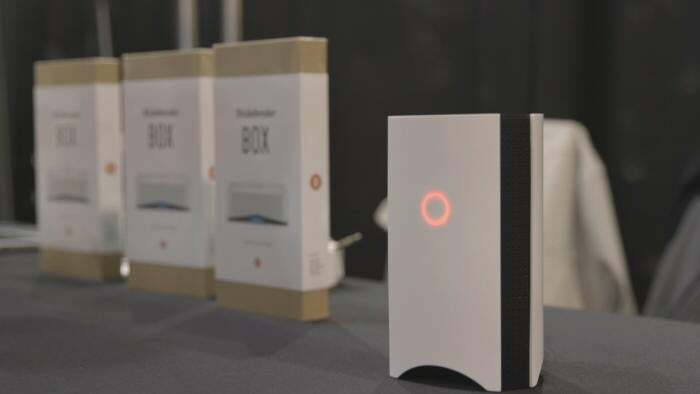 One, the Bitdefender Box checks to see if your devices are using default passwords, which is an easy way for them to be remotely taken over and used as zombies in DDOS attacks like the one that took down DynDNS, as well as Web services like Netflix and Spotify, last October. Second, if a device appears to be connecting to and sending data to a suspicious website—such as creeps that try to take over your baby monitor—it blocks access and alerts you via the associated app. Like the first-generation Bitdefender Box, the Box V2 can also be used as a direct replacement for your router, as well as supplementary protection. Based on our review of the first-generation Box, that’s a bad idea. But we’ll have to wait to test the new device to be sure.